When a quiet Asian girl finally finds her voice | AYAH! 10 years ago, a lot of things changed in my life. I was still adjusting to college. All my best high school friends had gone off to school elsewhere and left me to my devices in Fresno. I was in the midst of changing majors, saying goodbye to my parents’ aspirations for medical school forever. Instead, I decided to do something I knew I at least liked, but had no idea how it would apply in a real-life job setting: I majored in English. Feeling lost and uncertain, and wracked with endless chapters to read and essays to write, I did the only practical thing imaginable; apply for the campus radio station DJ gig. It was unpaid. It was another thing to add to my schedule. It put me in the crosshairs of the dreaded campus police meter maids. But I did it anyway on a complete whim. I blew it off, not thinking there was even a remote possibility that I would sign up. But I found myself unable to stop thinking about it. I was intrigued by the possibility that I could show other people all the music I knew and loved. I spent all my free time with headphones over my ears, or huddled with my boom box stereo on my bed. Music was my escape and I would obsessively listen to tracks I loved over and over again. Music was what moved me and I wanted to share that experience. So, I found the directions to the station and turned in my application. I had no prior broadcast experience. I had never stepped foot in a radio station. I think I barely knew what an audio board was. Joe Moore hired me on the spot. They were in need of someone who was conscious and breathing and could push the play button, over and over again. The music didn’t have to make sense, it just had to cover the awful sound of dead air. I remember my hands being very clammy. I walked into my first practice session clutching my stack of CD folders. Joe showed me how to operate the board. He hit record and gave me an hour. He told me to play music from the station. Hold up: you mean you don’t want to hear these tracks I had so carefully organized in my head? It was extremely daunting. I had never even heard of any of these artists. Iron and Wine? Jamie Cullum? Who? After all, I was a die-hard Aaliyah fan. TLC, Missy and Timbaland, the whole Bad Boy Records era. You see, I really became aware of music during the MTV generation. And everything has been a trace back to the roots that made that music ever since, and a reference point to the new music I have yet to discover. But I also had a soft spot for Aimee Mann and Nirvana’s “Bleach” album. The Beatles were of mythical status. I was in love with The English Beat, and just a few years ago, I listened to Pink Floyd’s “Dark Side of the Moon” for the first time. I was already broadening my eclectic taste in music. So, I pressed on, blindly playing records in the cramped KFSR studio. Luckily, I had a knack for skipping to the best songs. I just needed to hear the first couple of bars to know whether to move on, or keep listening. And that’s how I discovered music, and invariably, myself. I remember being awed by the endless rows of mostly unorganized CD’s, and the back room wall of well-worn vinyl. The records stretched from floor to ceiling, running all the way from one end of the narrow space to the other. I remember randomly pulling out vinyls to discover many, many old jazz records collecting dust. The place was a gold mine, a veritable treasure trove of music and freedom. I didn’t realize it at the time, but working at KFSR was one of the most fun and carefree experiences of my life. Where else could you have three hours to talk to the world and play hand-picked music from the heart? With the strict programming, automated, and commericially-viable station formats out there, KFSR was an oasis. It wasn’t later until the Afternoon Eclectic formed, that KFSR really began to hit its stride as a source of independent, quality, non-commercial music. With the guidance and support of people like Frank Dee, Joe Moore, Don Fisher, Don Priest (who all had their own amazing shows) and our many talented and long-standing DJs like DJ Prof, we really helped to lift the station’s status from a rag-tag mix of college garage band rock DJs, to the new beacon and voice in Fresno’s emerging art community. The Afternoon Eclectic eventually turned into the Evening Eclectic. Even though the music was so varied, it still had a specific sound. I landed my first job at a TV news station because of my experience at KFSR. I didn’t even know that it was something I wanted to do. I was just fascinated by broadcast in general and I thought it would be cool to operate cameras and see how a real TV news studio worked. I gravitated towards becoming a producer, of course. It reminded me so much of being a DJ at KFSR. I was able to select the music (stories) and organize them into a playlist (newscast), and I had control over the content (Music Director). KFSR helped me transition seamlessly from radio to television. And that’s what I’ve been doing ever since. KFSR also gave a shy and quiet Cambodian girl, a voice and courage to speak up. To this day, people ask me if I ever worked in radio. Yes, I still retain my radio voice and composure. It’s helped me keep my cool in the face of countless live TV disasters. Trust. Not only did KFSR equip me with the skills I needed as an adult, it touched me in an emotional way that only music can. It’s made me an overall better human being, with my ability to toggle between Johnny Cash, Jenny Lewis, Me’Shell Ndegeocello, Bonobo, The Roots, Mayer Hawthorne, and sprinkle in some Juana Molina for good measure. 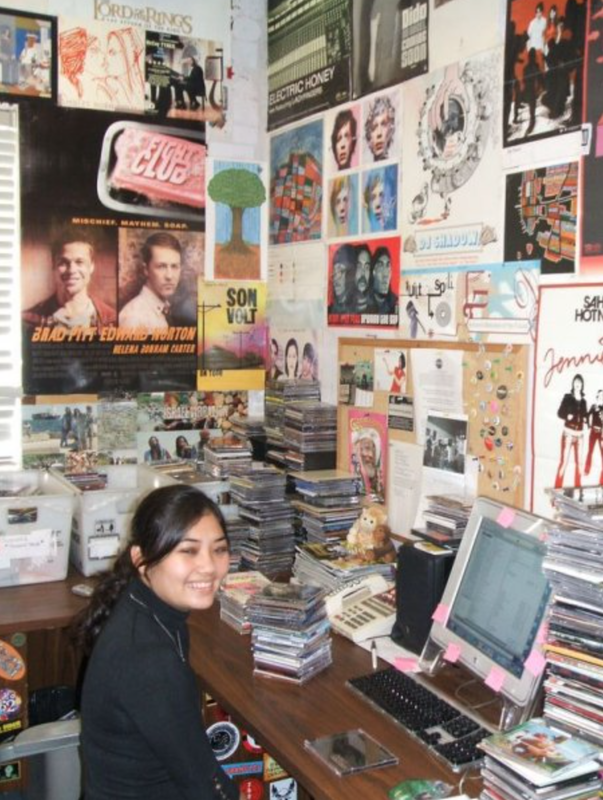 The music that I played at KFSR was the soundtrack to my life. Every now and then, I still encounter music ghosts. They’re the songs that you can’t quite hum. The names of the artists are a blur, and forget about the song title, that’s a lost cause. But even though I can’t quite remember the song, I remember how I FELT when I played it. I remember closing my eyes and absorbing the rhythm, the beat, the lyrics and riding every chord ’til the end. I wish I could go back and touch those songs again. I suppose I’ll be chasing after those music ghosts my whole life. But I feel a certain comfort in knowing that I was able to blast those tunes out to space; that somewhere, someone heard them and maybe felt the same way I did.